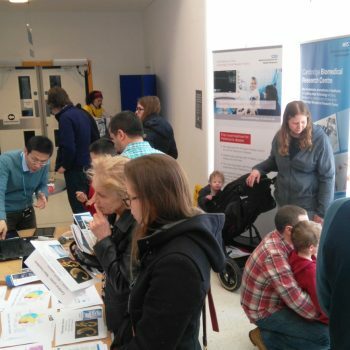 Researchers from the National Institute of Health Research (NIHR) Cambridge Biomedical Research Centre (BRC), took part in the Cambridge Science Festival on Sunday 26th March at the Cambridge Biomedical Campus. Hundreds of people visited the site and took a keen interest in the research happening on the campus. As well as meeting the researchers, visitors had the opportunity to look at some of the equipment researchers use everyday, look at their current work they are doing on the campus and ask questions. 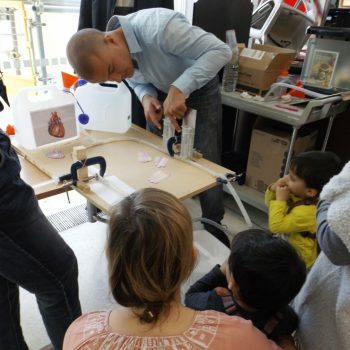 There were a wide range of displays to showcase the research and encourage children to become interested in science. 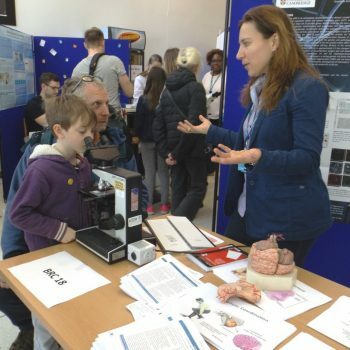 With one of her real lab microscopes on display, Dr Romina Vuono talked to visitors about her Parkinson’s research, examples of her work and how the brain functions. Teng and his team were there to talk to visitors about stroke research. Using water and ink, they had set up a circulation system to demonstrate what a healthy circulation system looks like and what we can do to maintain our own. Crina a research associate demonstrated to children how immune cells worked by getting them to make their own bracelets. 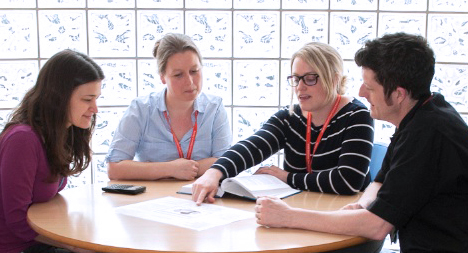 The Cambridge BRC Patient and Public Involvement team spoke to potential new members about what the panel does – reviewing research documents and working with researchers. The Rare Diseases team talked about rare diseases and explaining how our DNA makes us all unique using the example of colouring in a large zebra. The NIHR Cambridge BioResource were on hand to talk to people about the BioResource and how people can get involved in research, with the opportunity to sign up to the service. The team a played a game with children to understand their genetics.